Spend the first Friday of the year watching for the national park's feathery visitors. Spend the first Friday of 2018 watching for the national park's feathery visitors. FINDING A CHRISTMAS BIRD COUNT... when winter begins? They do pop up quite frequently, with a chirp and a flap and a trill and a squawk, around the mountains and deserts of California. In fact, there is such a profusion of join-in, volunteers-needed events that an avian-minded aficionado can sometimes feel gloriously overwhelmed. But pause for a moment, while reveling in that bird-based emotion, and decide what count you'd like to participate in as 2018 begins. There are bald eagle counts, yes, which ask a host of volunteers to call upon certain mountainous areas for a day, but there are also bird counts that focus on a specific area of the state. FRIDAY, JAN. 5, 2018: "The count is free and birdwatchers of any skill level are invited to join," states a post on Facebook. There are a pair of locations to meet at, and you'll want to pack your binoculars, a lunch, and a few other should-haves for the long-ish but highly rewarding day. Details? Squawks? Trills? 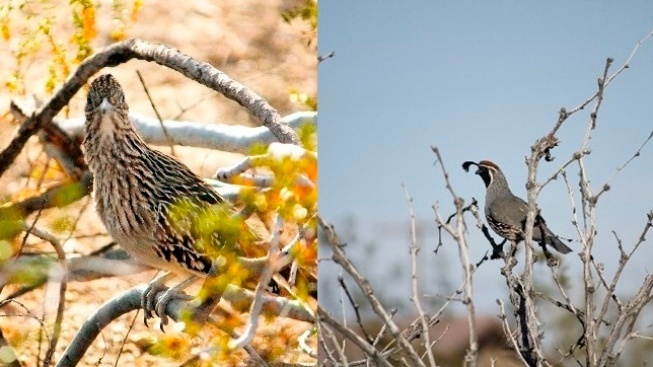 Possibly spying quails and roadrunners and hawks as they soar or dash by all of those amazing J.T. boulders? It can all happen, to launch your new year in a spectacular and giveback way, on the first Friday of 2018. Details.